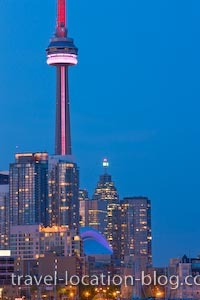 Picture of the CN Tower and city lights in the metropolis of Toronto on a clear spring night. and night lights of Toronto. The day ends with a night out with our friends at one of their favourite clubs but before relaxing and with a few tips from Alen our friend about some great spots to photograph Toronto from, Rolf captures a few photos of Toronto from a slightly different perspective. In the western flanks of the city is Ontario Place a conference centre right on the shores of Lake Ontario - the carpark affords a beautiful view of the city as night falls. Then later he moved to Little Norway Park, another interesting perspective.